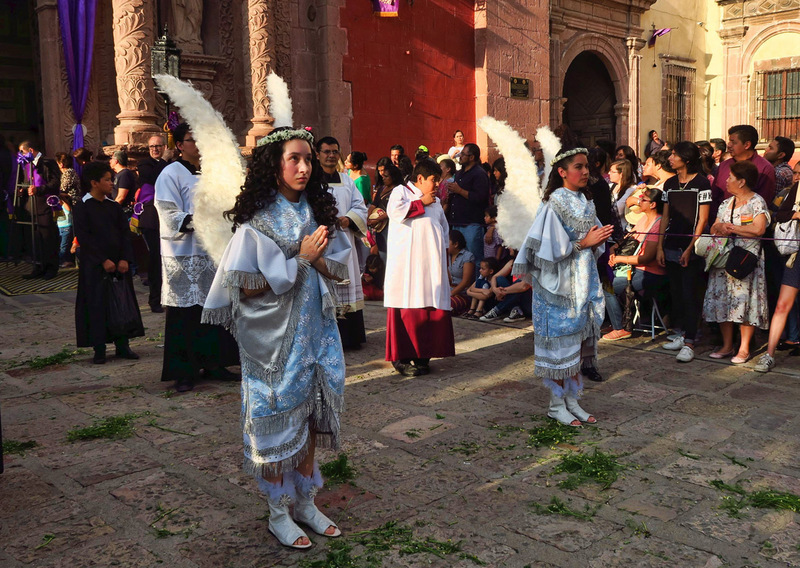 After two weeks of watching from the sidelines in Guanajuato as the Easter story plays out, the routes, costumes, statues, and backdrop have all become familiar. 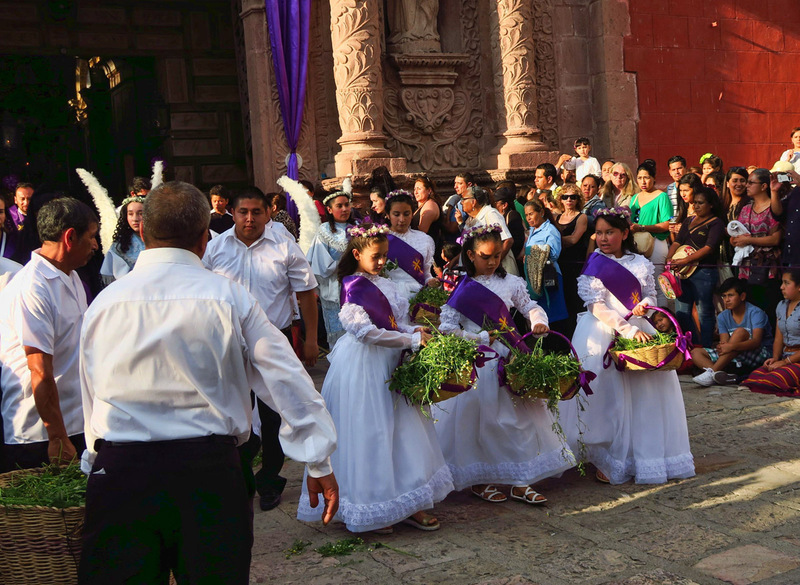 As we approach the “Grand Finale” of Easter Sunday, I am curious to know what the celebration is like in nearby San Miguel de Allende, known for its vibrant color and culture. 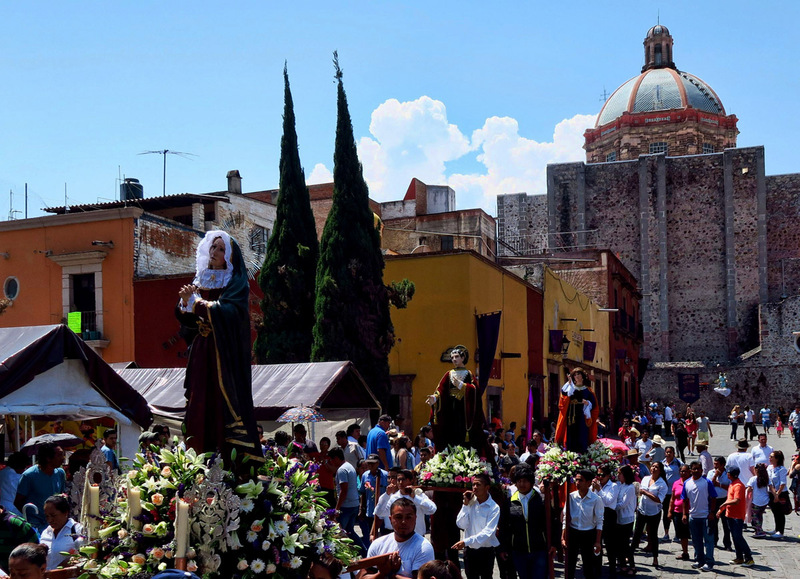 With frequent bus schedules between Guanajuato and San Miguel, a day trip is an easy hour ride away. I send my friend Holly, San Miguel resident of 26 years, an email to ask her advice. “Should I come on Good Friday, or Easter Sunday? Which will give me the most bang for my buck?” Holly writes back to say “Why not come for both? We do a bang-up job of Easter pageantry!” Holly offers up her guest bedroom along with the promise of a few tempting treats. Before you can say “Holly is a former chef,” my bus ticket is booked! Crew is erecting angels on the light poles. 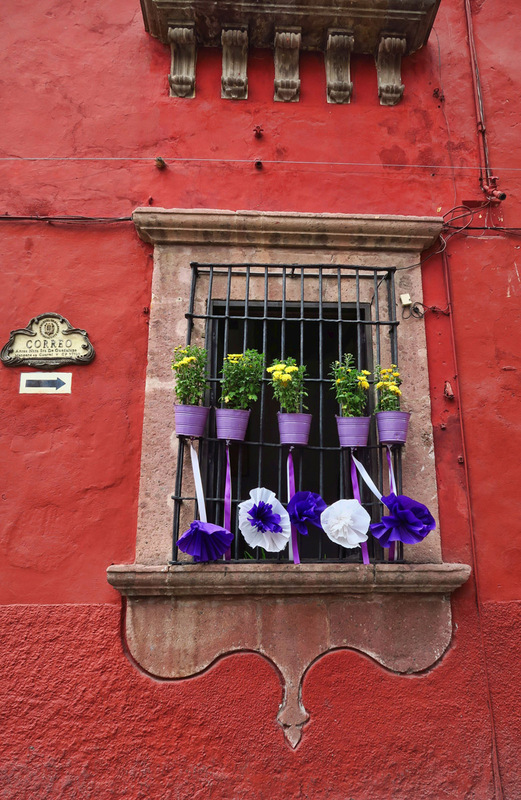 Some homes have decorated their windows and doors in purple and white. There are lots more ice cream stands than usual. This little boy is dipping out my favorite, “Maracuya” or Passion fruit. Amidst all the costumes and staged pageantry, this woman appears to be a devotee of great authenticity. 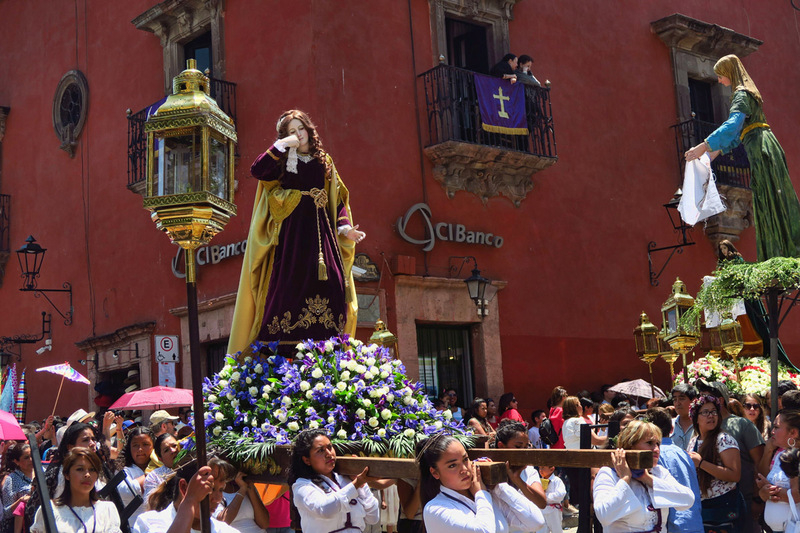 While on the bus, I get an email from another friend, Val, saying “The processions are starting NOW!” I worry that even though I am on the 10am bus, I may be too late. I grab a cab from the bus station, stop by Holly’s house in the suburb of San Antonio long enough to say hello and drop my bags. 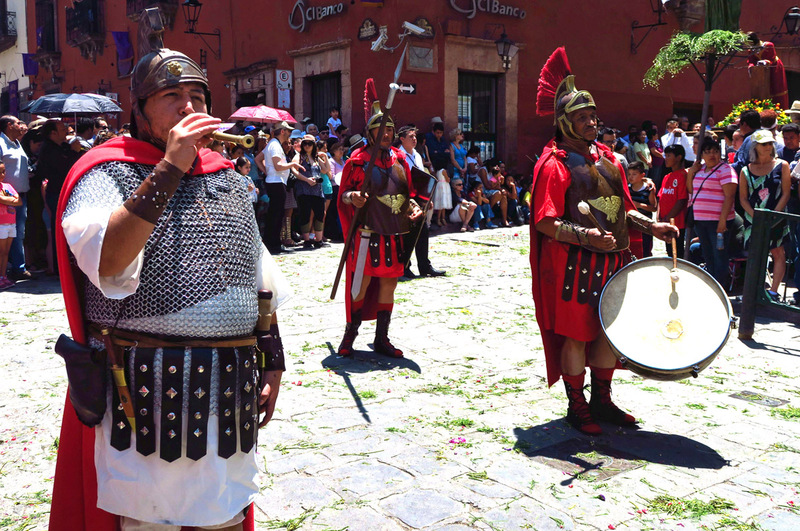 It’s hot in San Miguel. The forecast is predicting temperatures could reach 90 degrees. Worse yet, the crowd forecast is predicted to reach one hundred…..100,000, that is. 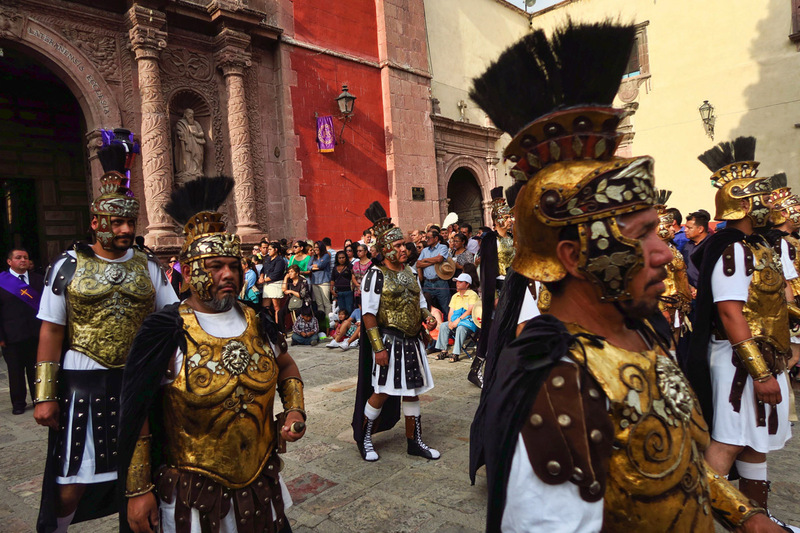 It’s the pinnacle of the tourist season in Conde Nast’s “World’s Best City.” It’s going to take some fortitude to face the festivities. Armed with Holly’s favorite “cooling neck scarf,” a large bottle of water, and my camera, I take off at a brisk pace bound for the Oratorio, reported to be the epicenter of pomp and circumstance for the weekend. 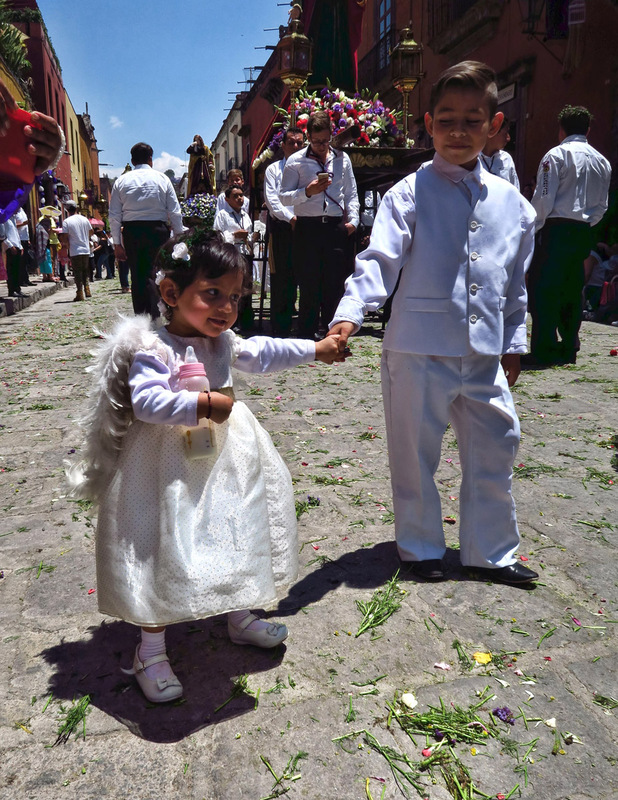 At first, I’m a little disappointed, as the streets seem deserted, a rarity for San Miguel these days. I expected decorations everywhere, but with the exception of a few purple ribbons and bunting hanging from balconies, it’s a bit of a bust. 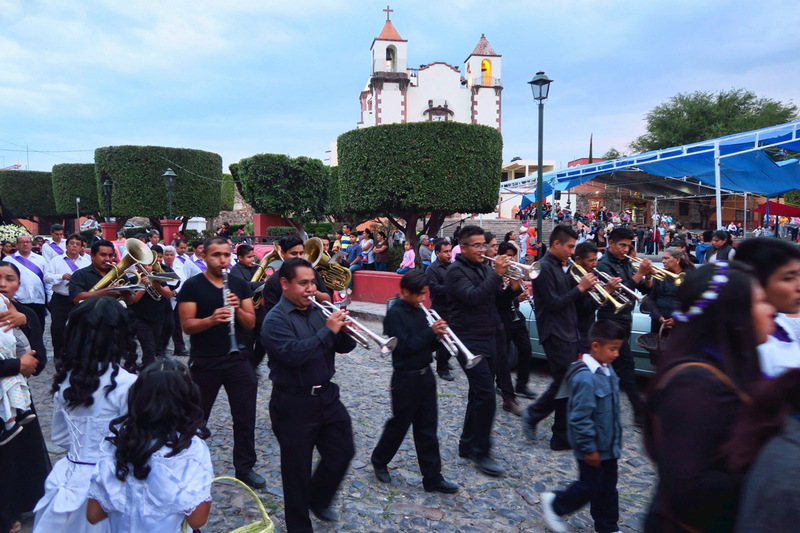 I catch the tail end of a small parade, just as it is re-entering the Oratorio. I hope I haven’t missed the best part. 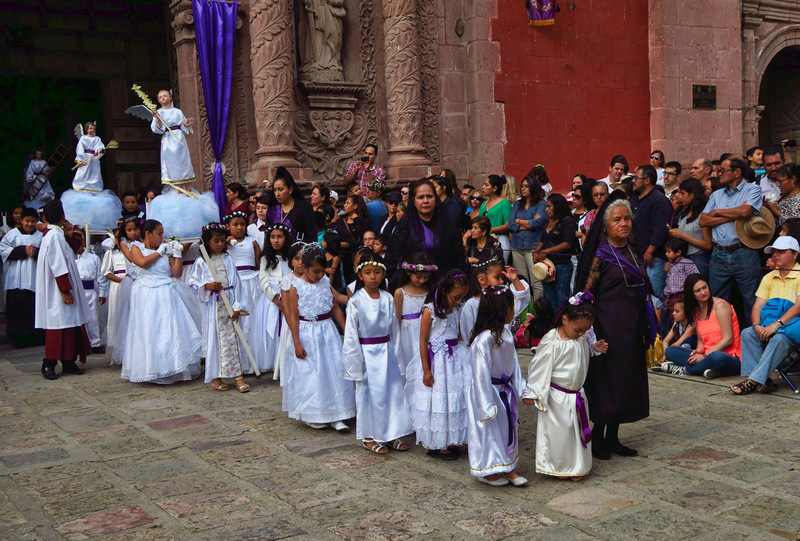 Upon arrival, I catch the tail end of the 10:30am procession which commemorates Jesus’ meeting with the Holy Mother. 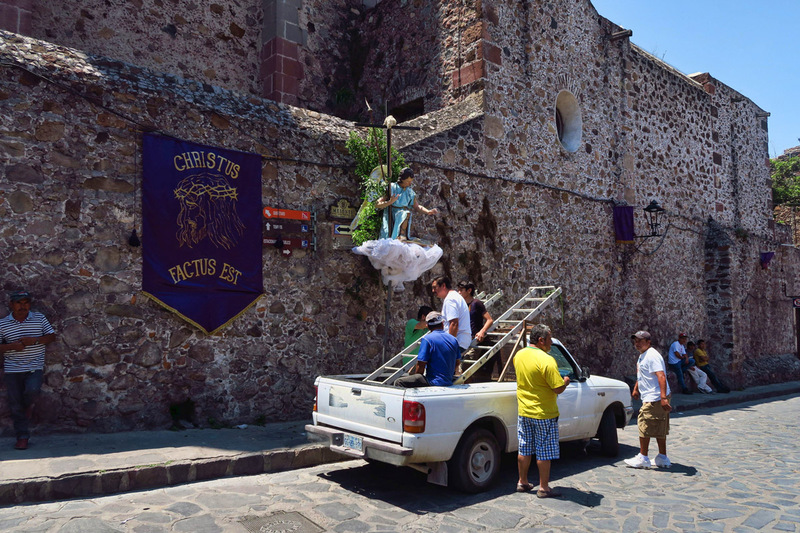 The procession is returning to the Oratorio, its original starting point two hours ago. 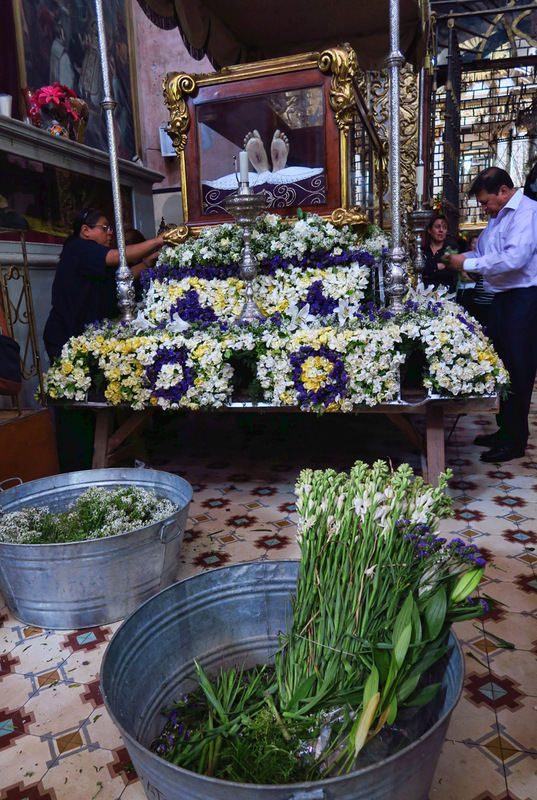 Once these “floats” are returned to the church, demolition begins immediately, with people flocking to remove the fresh flowers. 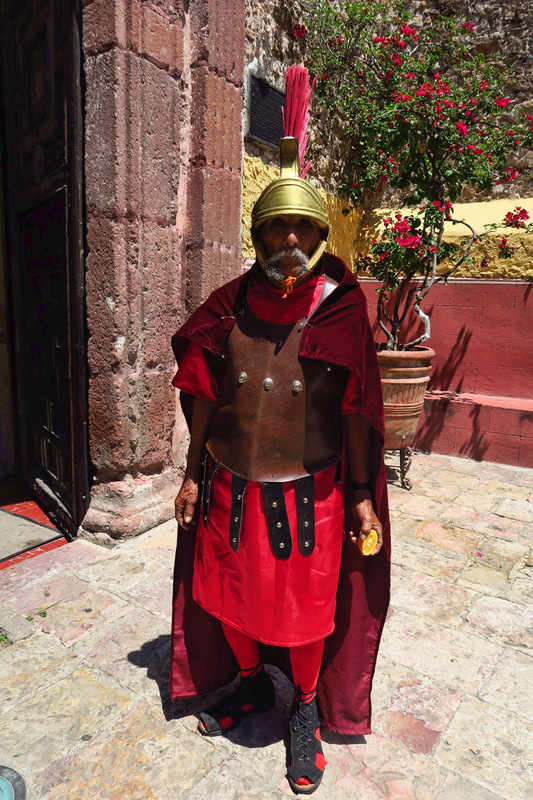 This Roman soldier takes a break from eating his orange long enough to strike an imposing pose. 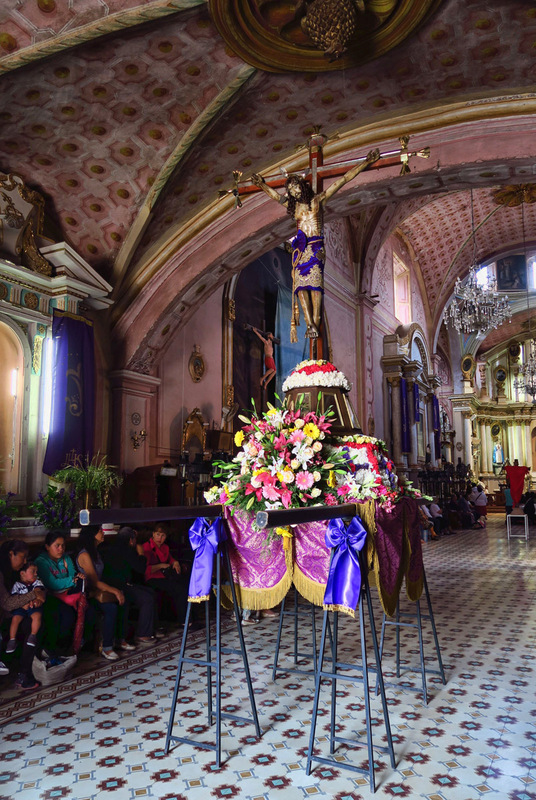 I stop by the Oratorio, and there are “human-powered floats” all over the church, each one surrounded by a group of people busily stuffing fresh flowers into every possible nook and cranny. 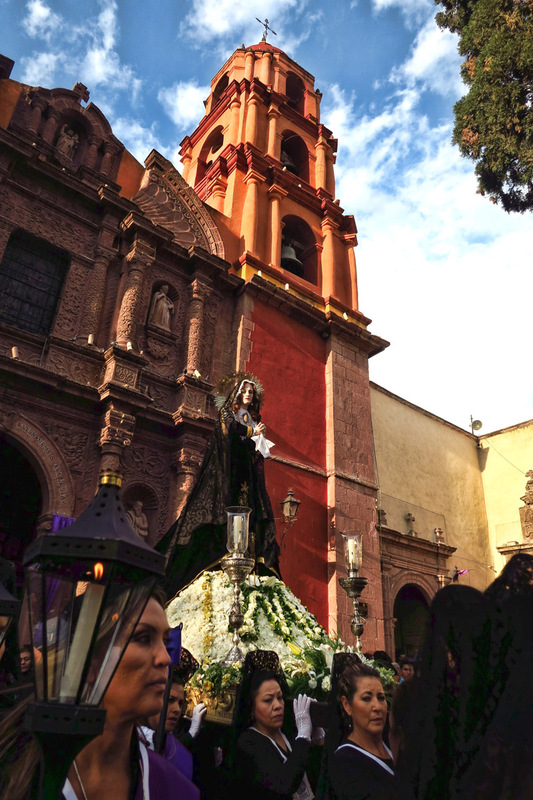 The church is a beehive of activity, with many women clad in all black, tending to the flower-covered platforms that will carry saints through the streets. 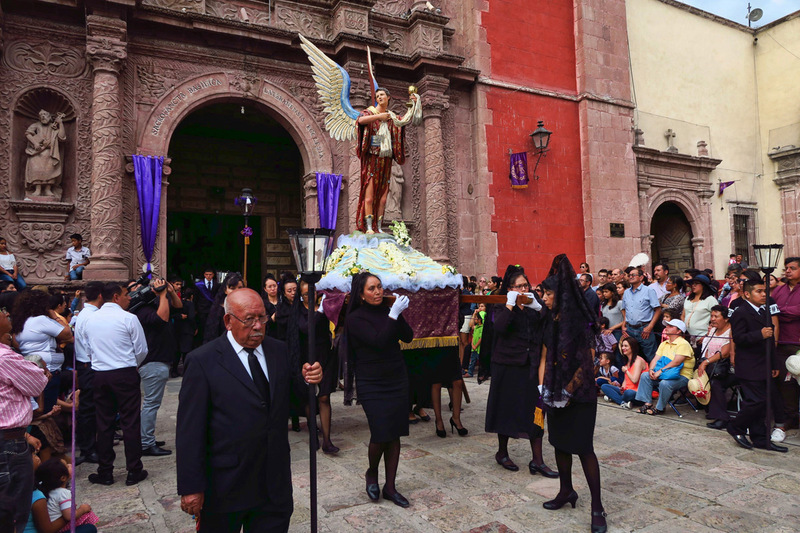 The largest of these platforms to be carried on the shoulders of the mourners in the cortege is a glass coffin holding a life-sized statue of Jesus. I am seeing signs that maybe I haven’t missed it after all, and in fact, the best is yet to come. A gentleman tells me the main “funeral procession” will take place at 6:00pm, with more than 1,000 parade participants. 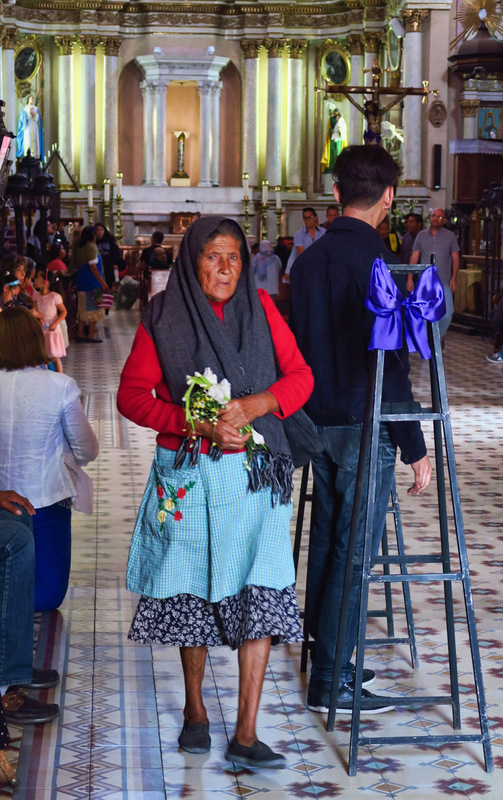 Lots of activity inside the Oratorio as they prepare the “human-powered floats” with flowers. This is a large glass coffin containing life-sized Jesus. Through the glass, you can see the wounds in the soles of his feet. 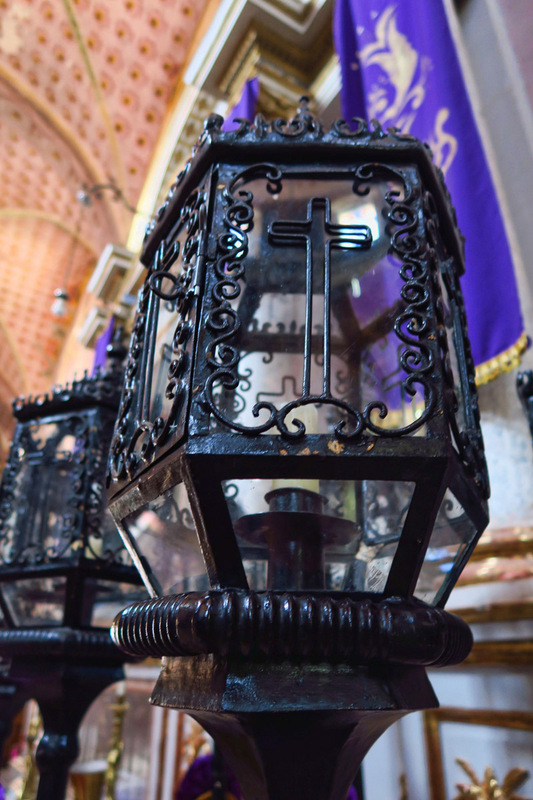 The church is filled with hundreds of these decorative lanterns containing candles. These will be used in the funeral procession. Filling in the gaps with flowers around the base of the giant statue of Jesus. They move the statue to the front of the church, as it will be the first one out during the 6:00pm procession. Here is the finished product, ready to be carried out. Meanwhile, there is a smaller parade beginning at noon. 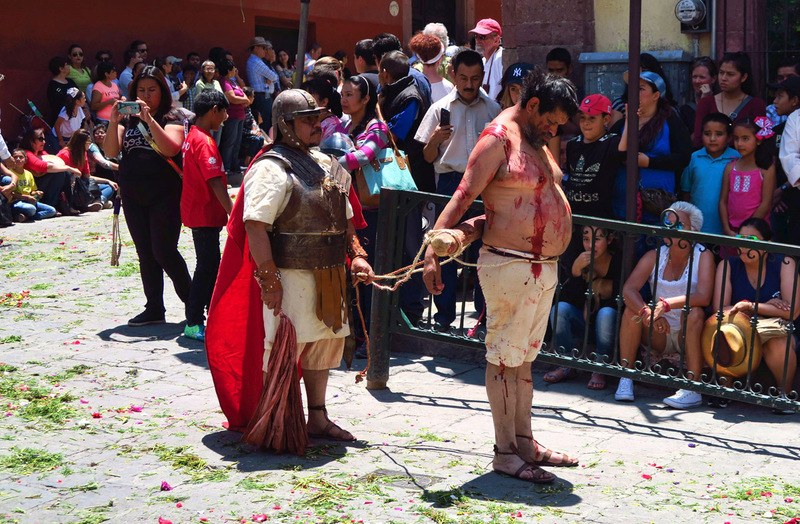 This ceremony represents the sentencing of Jesus by Pontious Pilot. There are Roman soldiers on horseback. 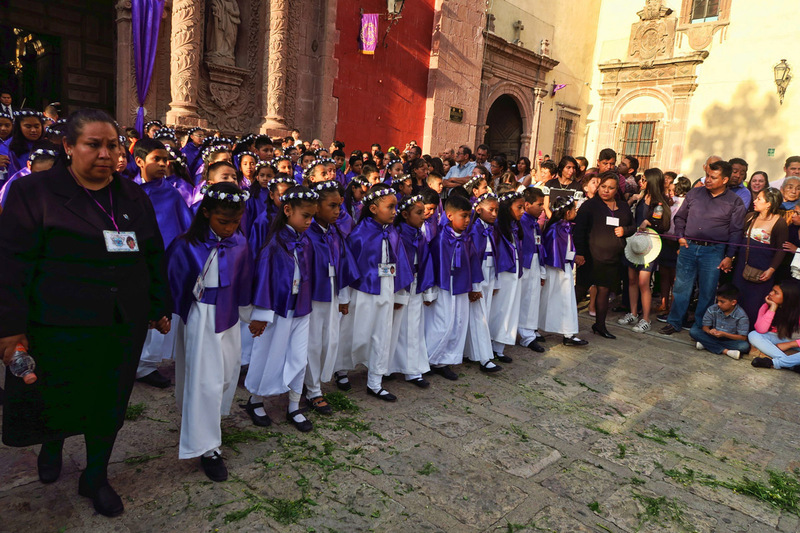 Men and women carrying crosses are adorned in purple cloth according to scripture. And there is even public flogging of the thieves. 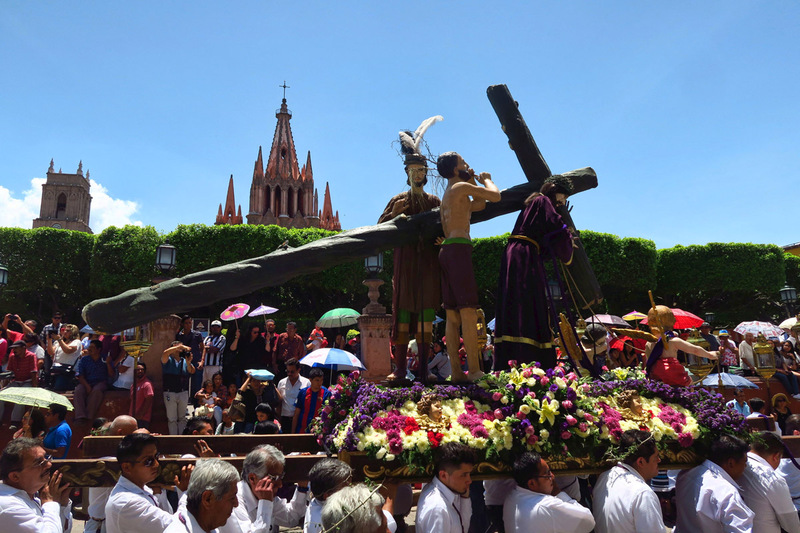 This smaller mid-day parade culminates with a large statue of Jesus bearing a cross, symbolizing his journey toward crucifixion. 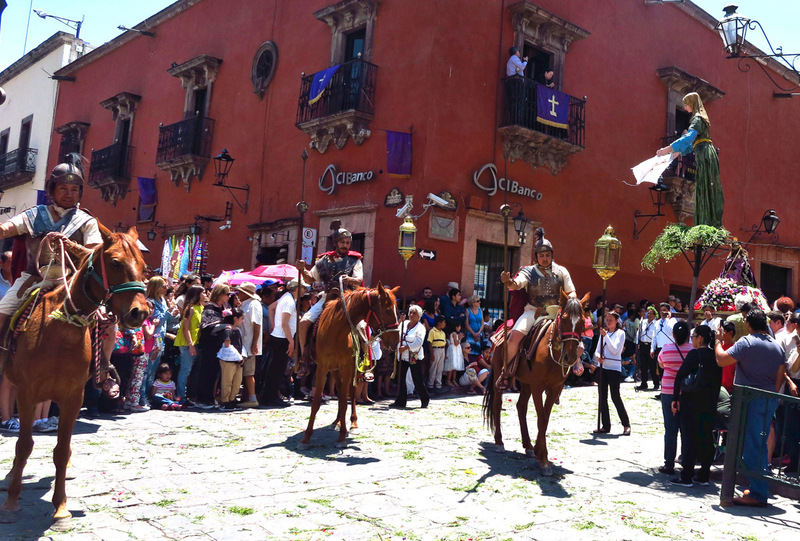 The procession at High Noon on Good Friday gets started with soldiers on horseback. This man stops the procession and reads something from the scroll in his hand…I presume to be the sentence following the trial. Soldiers play a solemn tune. 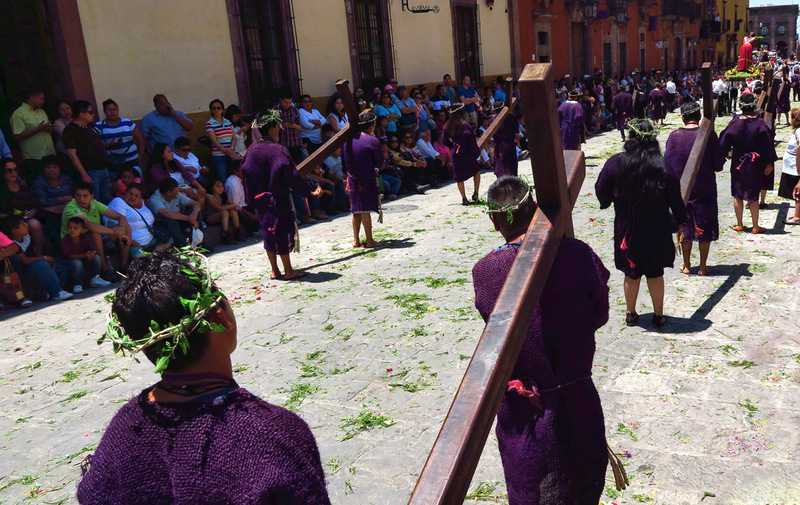 There are about twelve men and women carrying crosses. This is considered a great honor. Though it is 90 degrees, a few have chosen to walk barefoot. There is public flogging of the thieves. The singing of these children is so sad, some people actually cry. This is the grieving Virgin Mother, given away by her handkerchief. 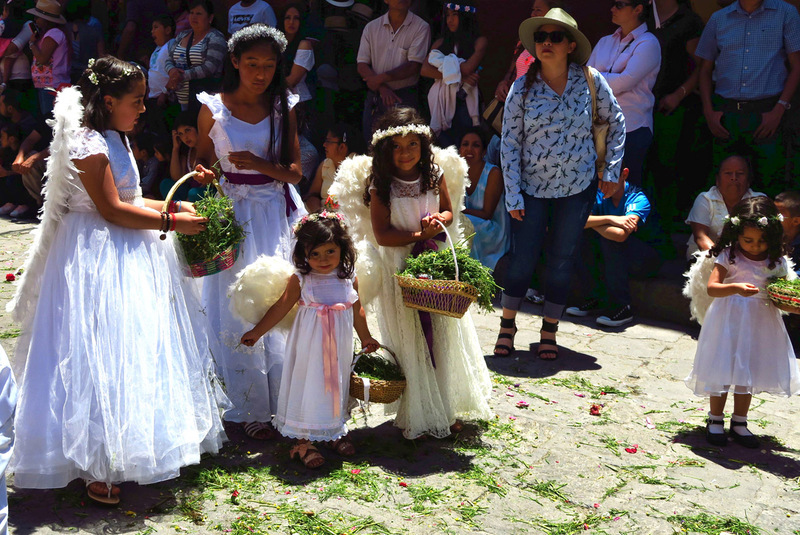 Young girls are scattering chamomile and rose pedals. Finally, Jesus arrives carrying his cross. By 4:00pm, people are already lining the streets with their lawn chairs in prep for the Grand Finale of a funeral, La Procesión del Santo Entierro, or the Holy Burial. Two hours is too long for me to wait, but I come back an hour later to find a “hole” along the rope line in front of the Oratorio. It’s now around 5pm, so I decide to test my endurance at standing in one crowded spot, shifting my weight from one foot to the other for an hour. 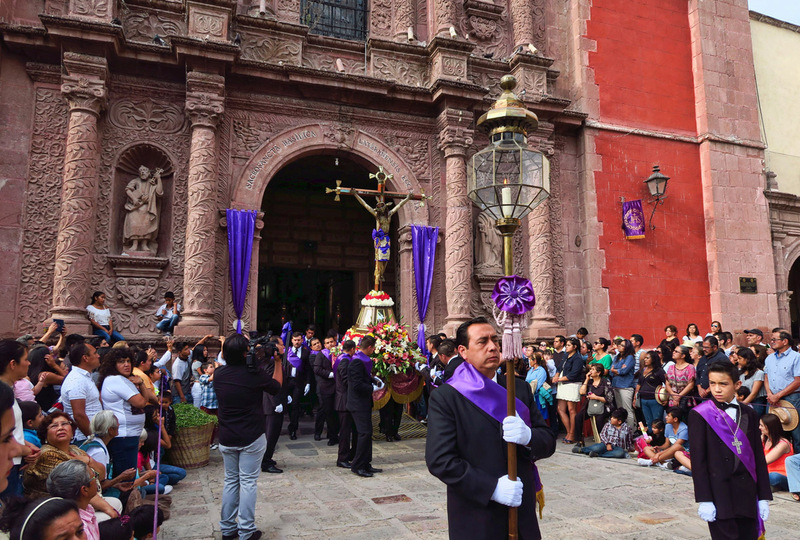 Luckily, the people-watching provides a welcome distraction, as hundreds of “mourners” enter the church to queue up for the parade. 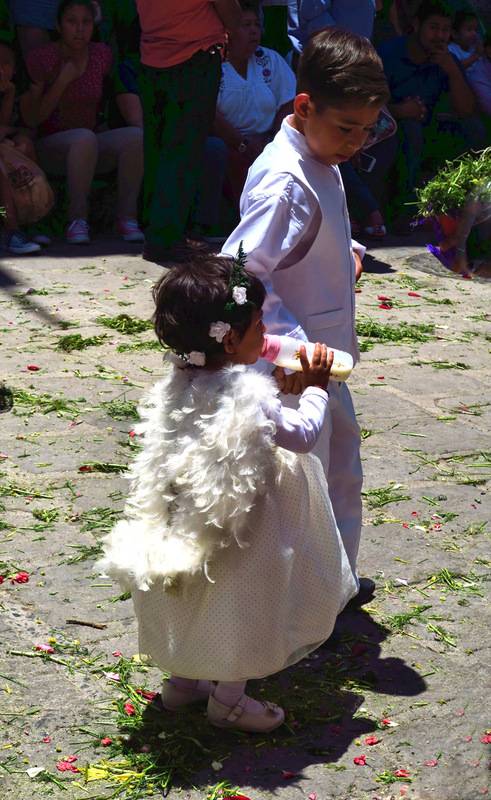 Men in suits, young boys in suits, young girls with feathered wings and flowers in their hair. 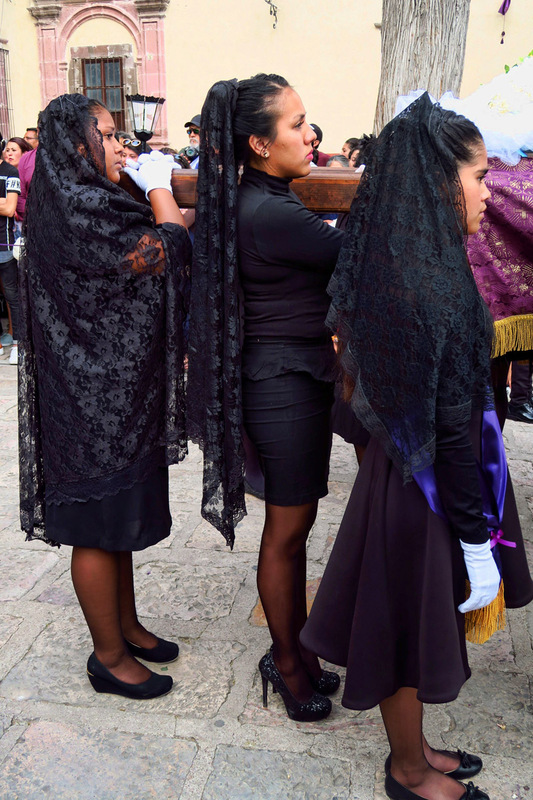 And then there are the “black widows,” over a hundred women dressed from head to high heels in black, their long black mantillas elevated high on their heads by a peineta, or comb, with lace cascading over their shoulders. 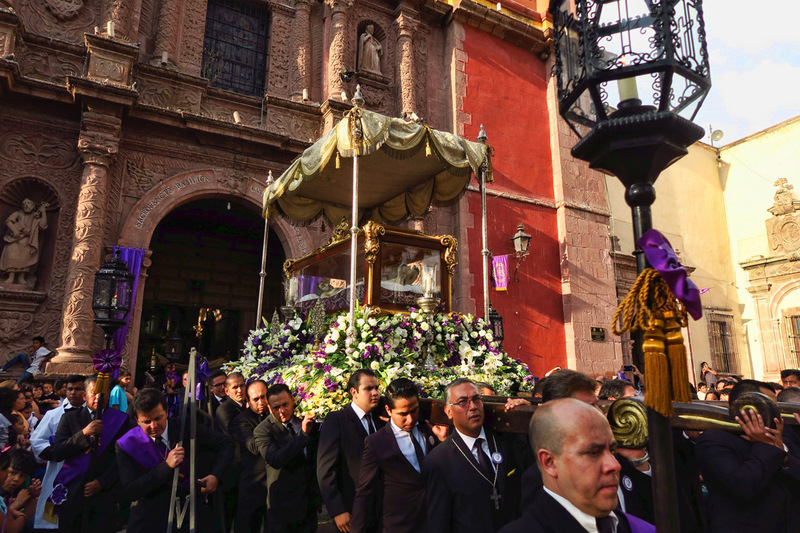 La Procesión del Santo Entierro, or Procession of the Holy Burial starts right at the stroke of 6:00pm and not a minute later. This statue of Christ is the one I watched being decorated with flowers earlier this morning. 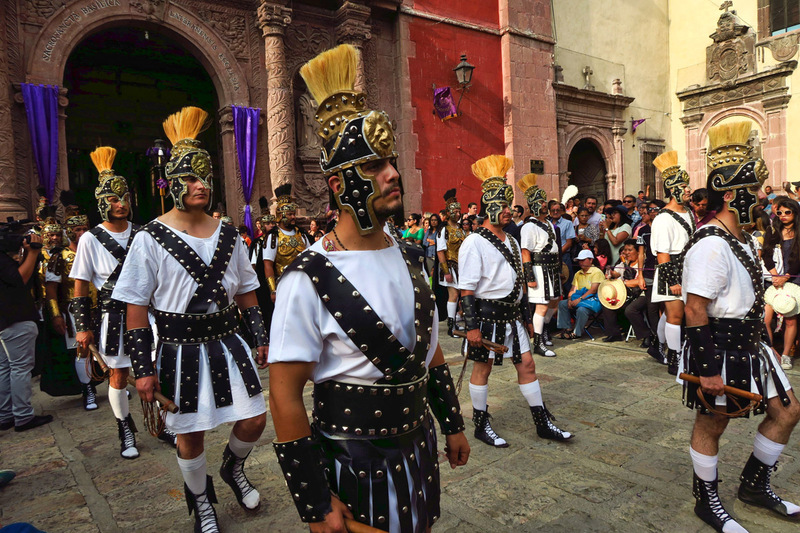 Roman soldiers lead the procession out of the Oratorio. They are pretty good with these flutes. 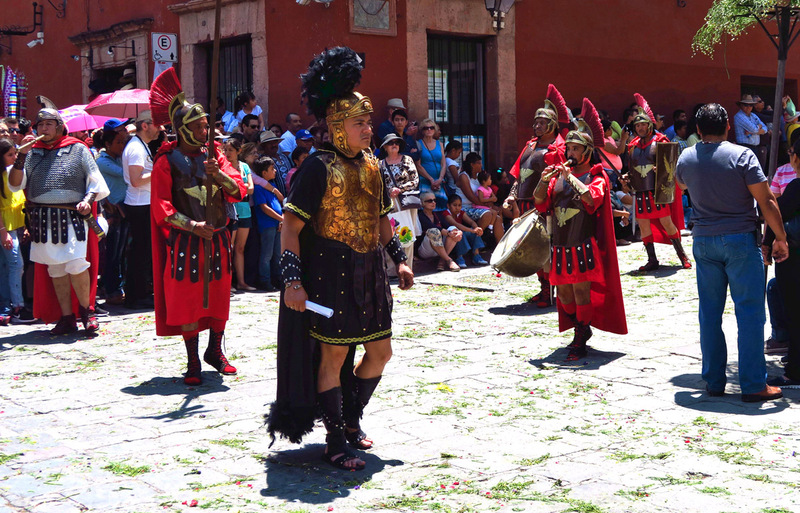 This group of soldiers is atypically tall by Mexican standards. I wonder where they found so many tall, statuesque men in a country where the average height for a man is 5’4″. I wish I knew what the different uniforms signified. I am captivated by all these little girls. They are so adorable! 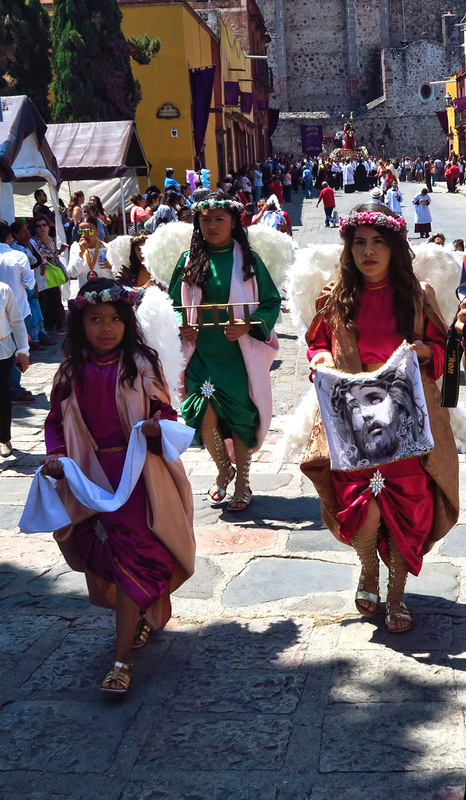 These four are carrying a cross with a blood-stained shroud. The funeral procession starts promptly at 6:00pm. The sidewalks are packed with spectators. 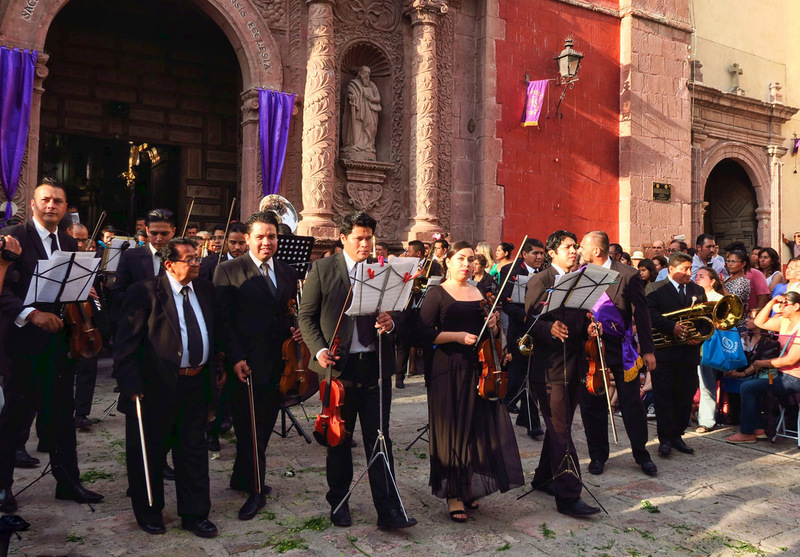 Being near the Oratorio, I have the benefit of a continuous soundtrack, as the full marching orchestra plays as it waits its turn to exit the church. 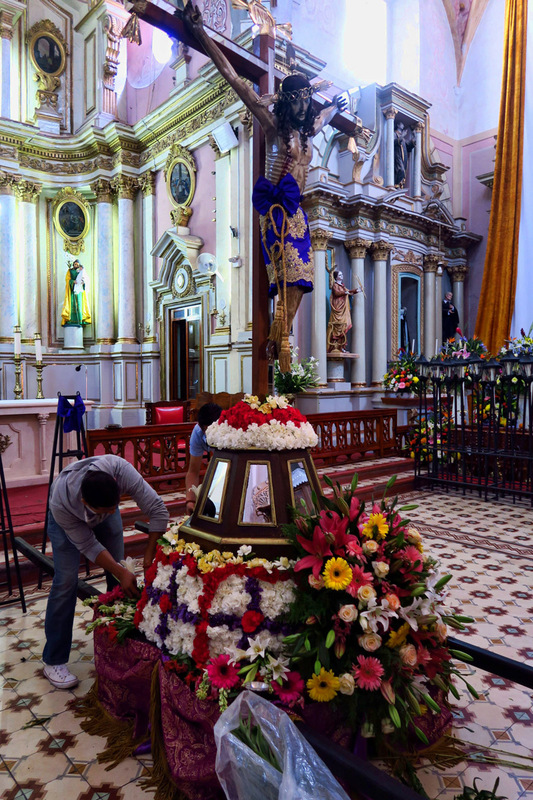 At least a dozen statues of saints are carried out one by one by the mourning women, all wearing white gloves. 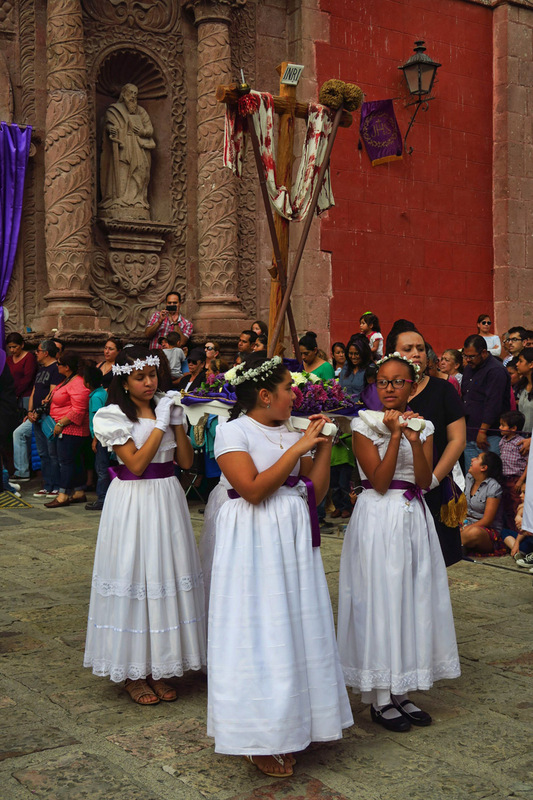 Interspersed among this parade of saint statues are young girls dressed in white strewing chamomile and flower pedals on the street, young choir members singing haunting hymns, and a full blown strolling orchestra, complete with a couple of cellists. 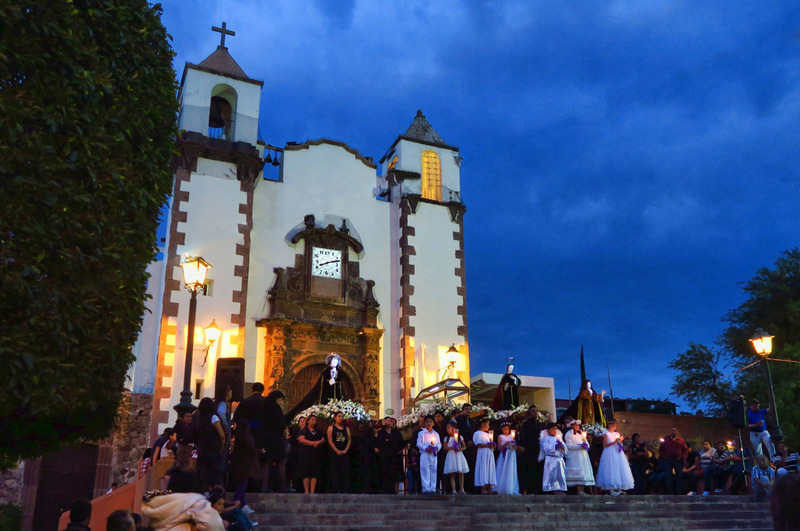 This parade with its candle-lit lanterns, will continue at a snails pace through the streets of San Miguel until darkness falls. As each one of these statues comes through the front door, the women must dip down to clear the opening. Check out those sequined heels! 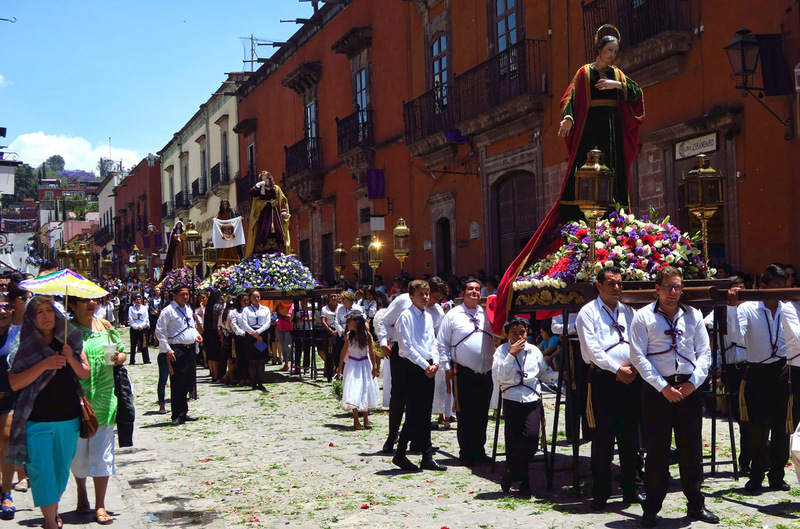 She will be on her feet carrying a heavy load, walking on cobblestone streets for almost three hours! These small girls are scattering chamomile along the path. Following the glass coffin is some high priest…not sure of the title, but high enough to warrant a portable awning over his head. 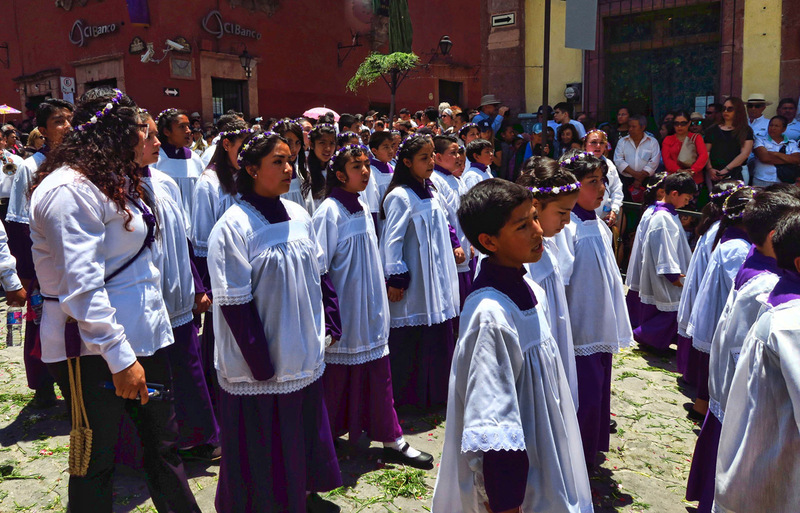 These young voices sing a haunting hymn that sends chills up my arms. The strolling orchestra. They stop frequently to play. 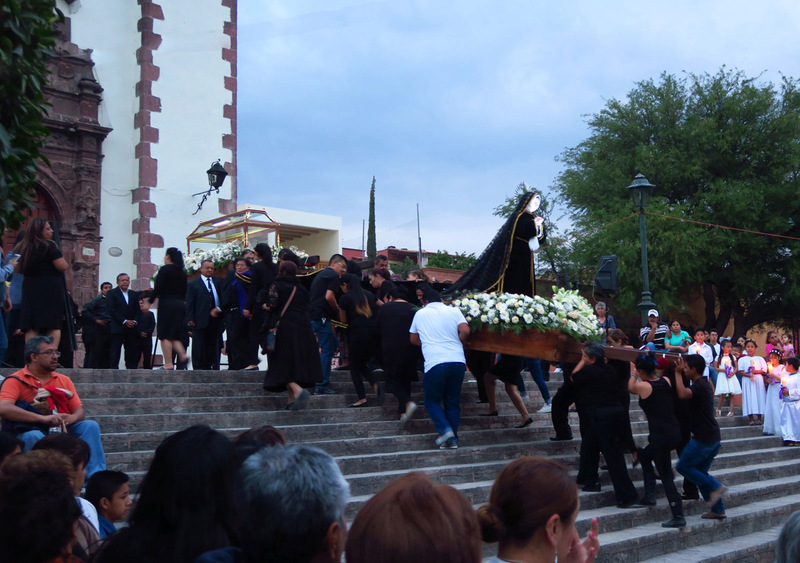 The second to last platform to leave the church carries the statue of the grieving Virgin, carrying her handkerchief. 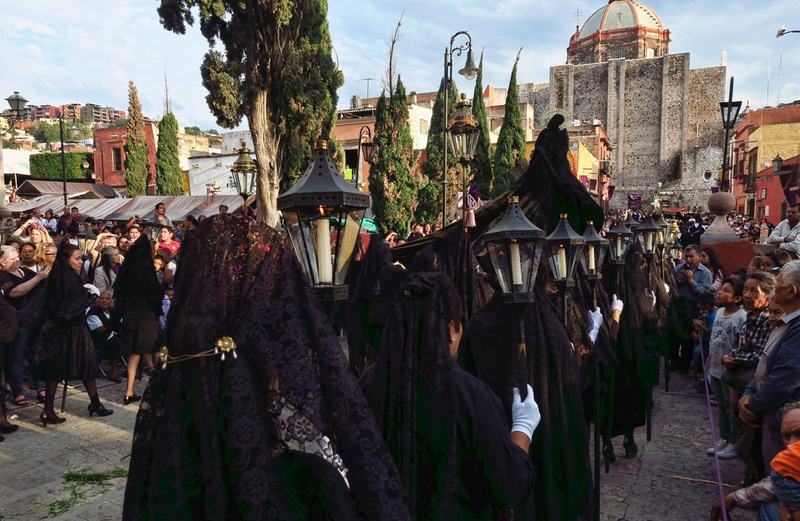 The mourning widows follow in a line carrying candle-lit lanterns behind the Virgin, who is also draped in black. You can see the back of the statue in the upper right third of the photo. The End. 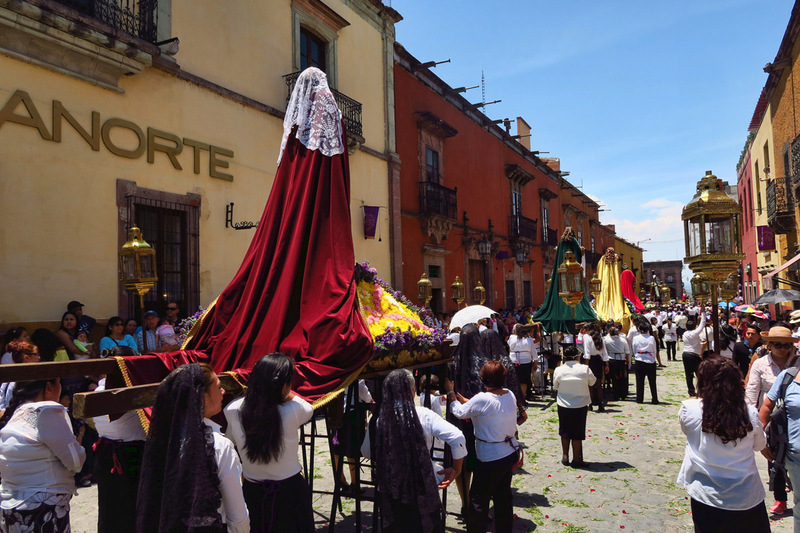 The cross is the last of the full cortege which has finally left the Oratorio, but it will be two to three hours before they make the loop around town and back again. 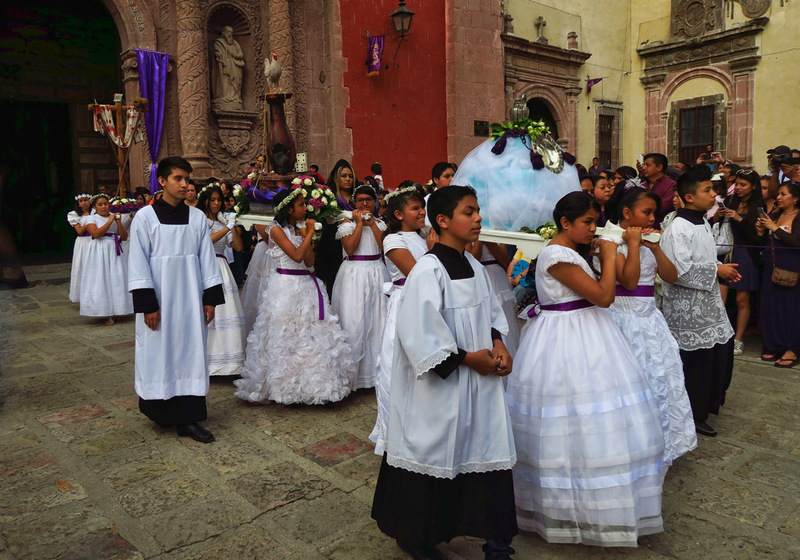 Saturday is a solemn day following the mother of all funerals, as mourners await the resurrection. 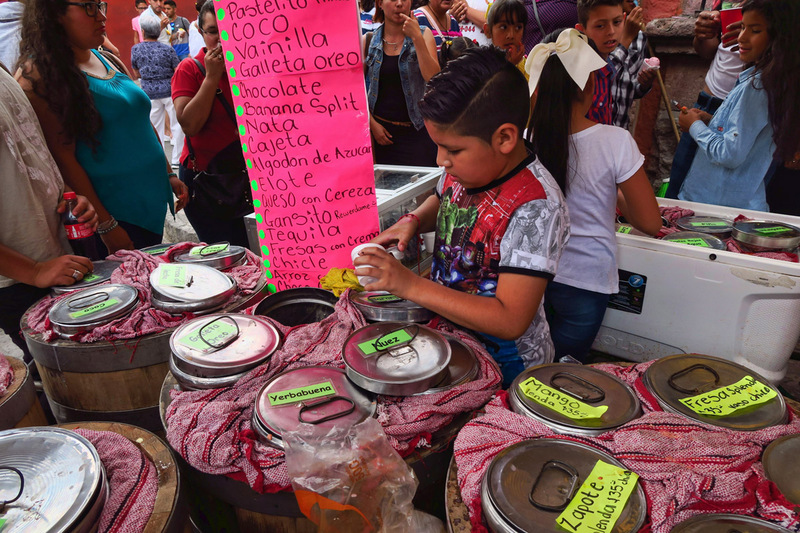 I spend the day running errands and shopping in the gringo section of the local La Comer market for a few items I can’t seem to locate in Guanajuato, and hanging out with Holly and her lovable pooches. On the way home from the Grand Funeral, I come across a similar procession on a much smaller scale. 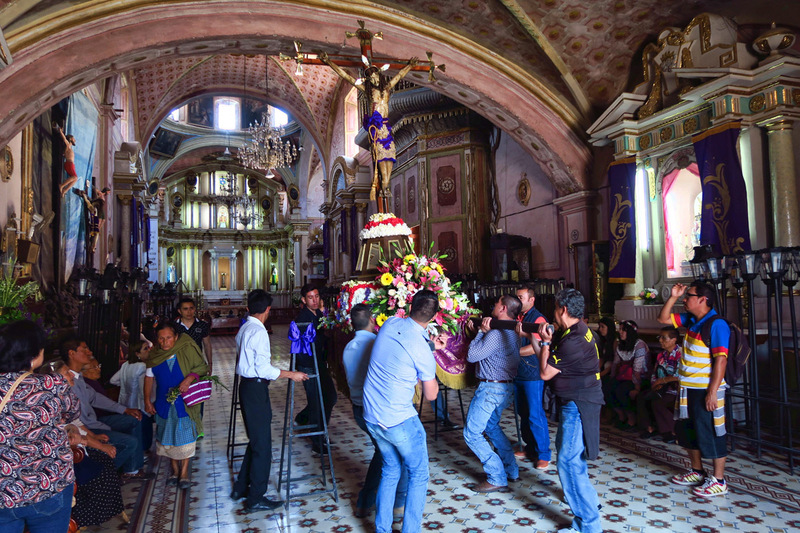 Holly lives in the neighborhood of San Antonio, a suburb of the Centro Historico. The neighborhood church is in the background. 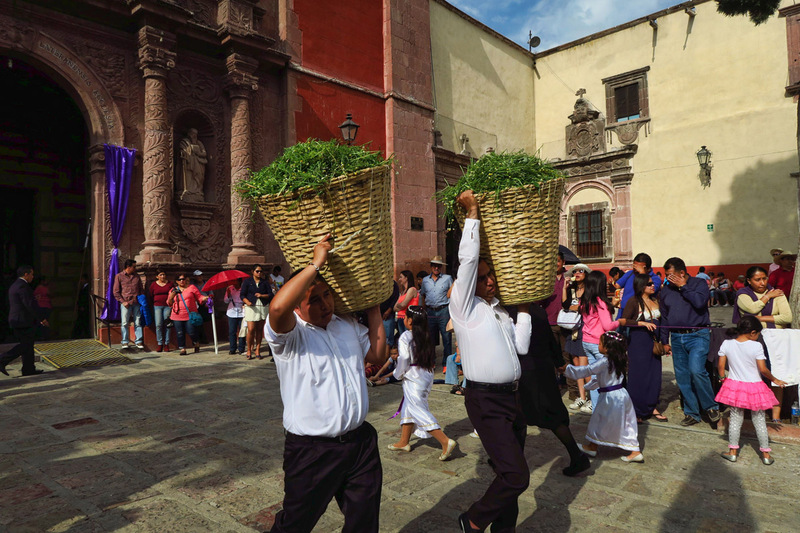 They are following the same traditions, just with more of a local version with much less pomp and circumstance. When the Saint-bearing platforms reach the stairs, they turn them around and back them up the staircase so they can face out onto the plaza. This smaller, intimate ceremony is very touching. 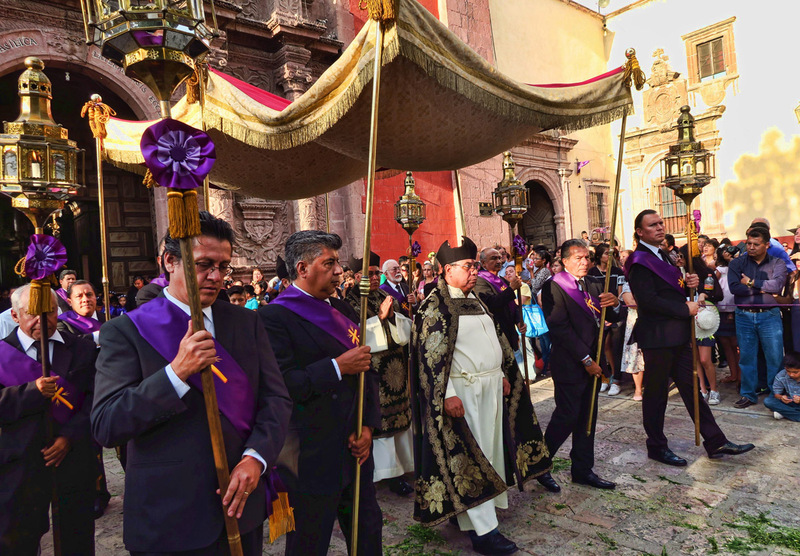 Sunday brings the final day of Semana Santa…the grand finale of Easter Sunday. 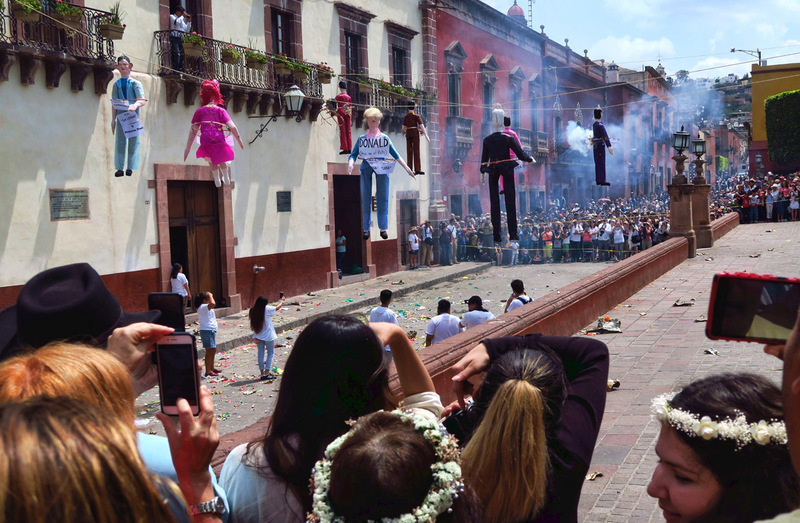 After a phenomenal brunch with Holly at AguaMiel, I make a mad dash for the Jardin for the final act of the two week celebration, the tradition known as “Evil on Fire,” also known as the “Burning of the Judas.” A dozen life-sized paper mache’ effigies of evil are strung from the balcony of the Old City Hall to be “burned” (exploded with fireworks) one by one. There is the token devil and witch, a few politicians and public enemies. 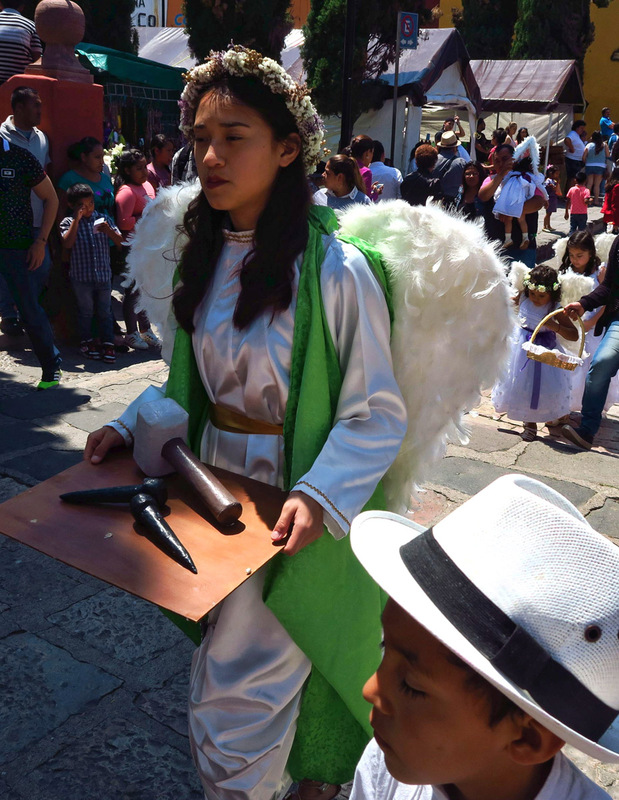 But they will save the best for last….a pouty-lipped, pale effigy wearing a suit with a straw thatch on his head, wearing a sign that says “Donald….pero no el pato.” Donald, but not the duck. 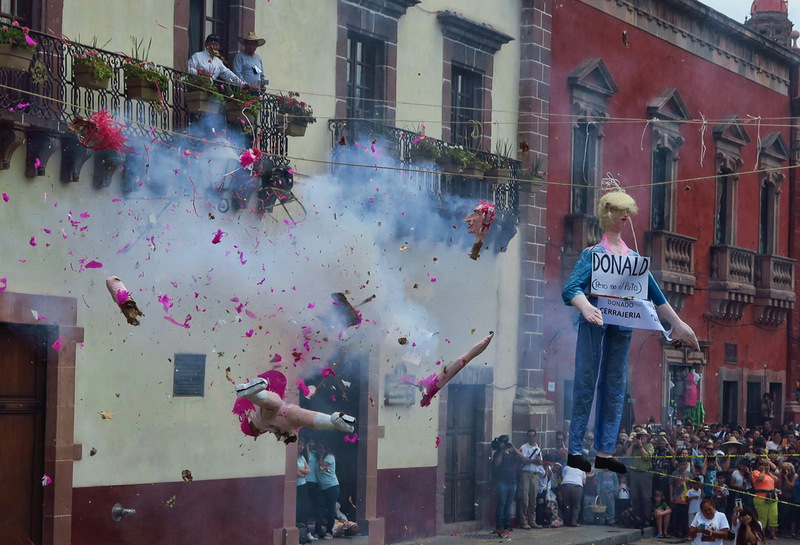 As each of the effigies are lowered for their fuses to be ignited, the crowd chants, “Doh-nold! Doh-nold! Doh-nold!” There are just as many gringos chanting in the crowd, and the Mexicans seem to get a kick out of their enthusiasm. 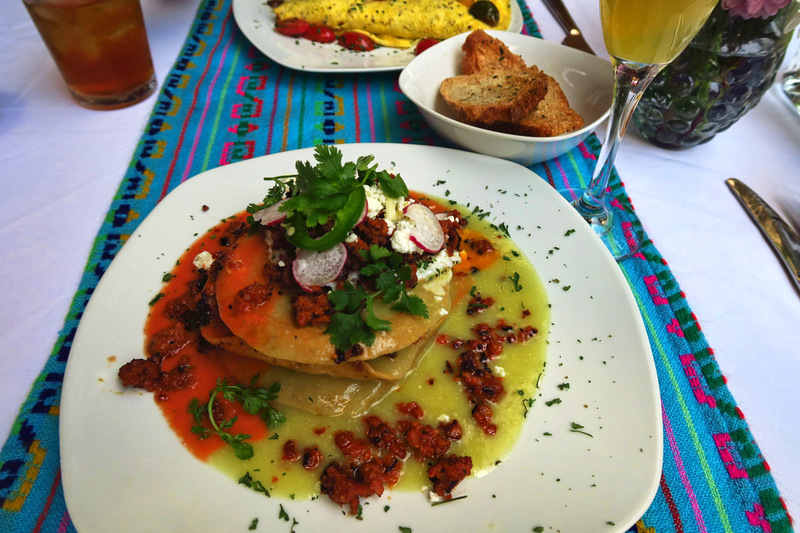 Wonderful Sunday Brunch from AquaMiel…Chiliquiles con Chorizo. High Noon in the Jardin for the Burning of the Judases. The one on the right should look familiar, though they needed to add a bit more paper mache’. Scrambling for souvenir body parts. His is all that’s left of The Donald….his thatch of straw hair. The blue-suited effigy spins and twirls and spews and fizzes around and around in circles until finally, the long awaited moment comes…BLAM!!! 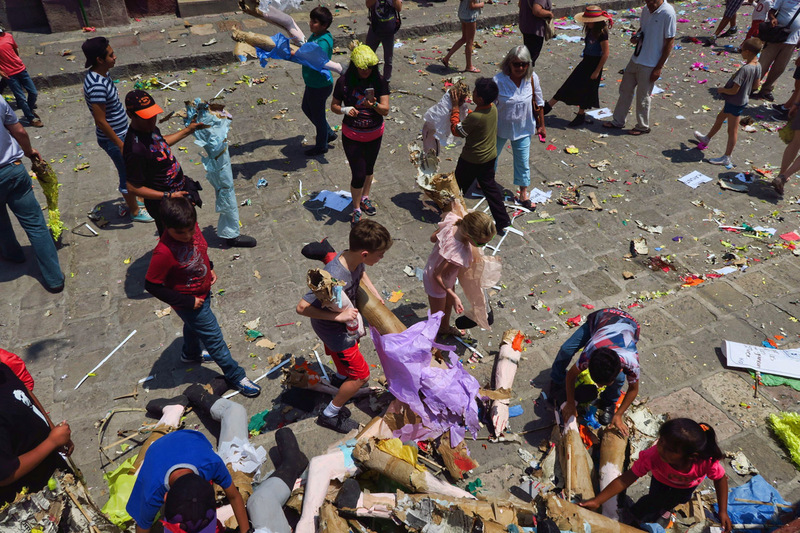 As paper bits go flying through the air, the crowd goes wild, and young children run to retrieve the remnants as souvenirs. But heads of the effigies will be sold by the artisans, the price depending on what’s left. 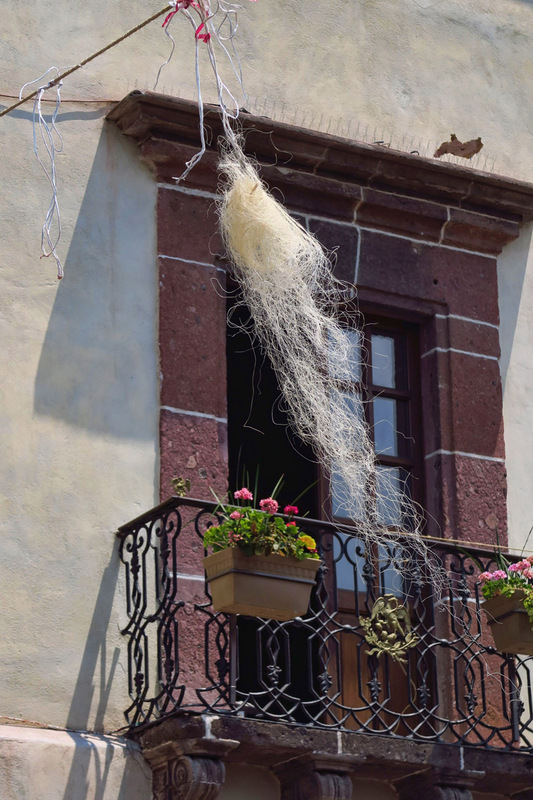 Alas, the only thing that remains of poor Donald is his thatch of straw hair, dangling from the rope above. 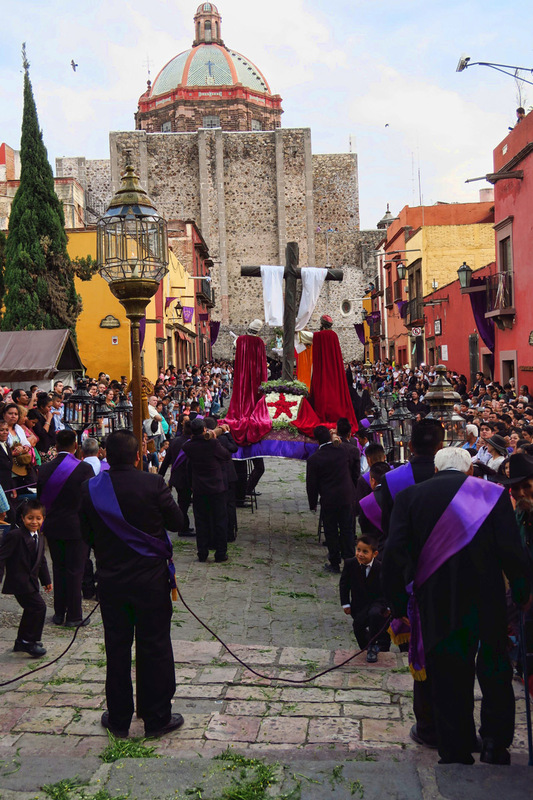 This entry was posted in Mexico, San Miguel de Allende and tagged Burning of Judas, Semana Santa by Suzanne. Bookmark the permalink. Never apologize for posting, Suzanne. This is a revelation. 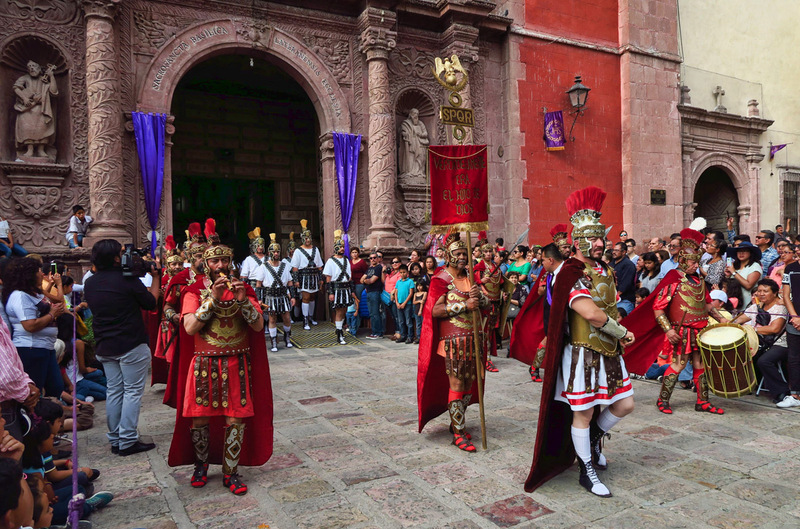 I never realized there was so much “pomp,” imagery, and pageantry to Easter Celebrations in Mexico!!! Kind of puts our “Easter egg hunts” in perspective. Thanks for braving the heat and crowds. Wow, this is Catholicism taken to the max! Fascinating to see, though incomprehensible to this non religious person. LOVE the ending…if only it were so simple to rid ourselves of the buffoon. The country certainly does go over the top with its celebrations! My feet ached just thinking about three hours on those heels!! Great job documenting the celebration! Love the end!!! 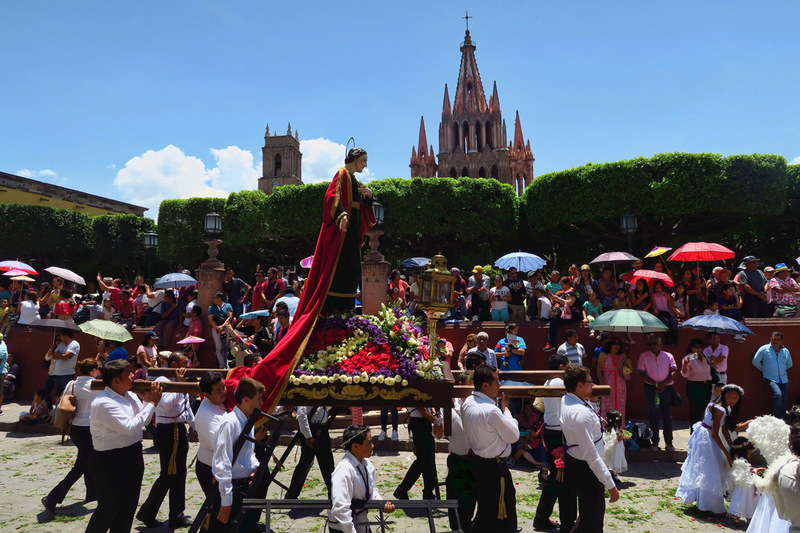 It was interesting reading your posts covering the Holy Week celebrations. You did a nice job with your pictures and covering it all in a fair and unbiased manner. I grew up in a Catholic family and attended parochial school. As a kid, I got dragged to church on every Sunday, holy day, saint day, and feast day. I recall it all being very solemn, respectful, and serious. Catholicism didn’t stick with me as a adult but I still maintain a spiritual faith. I also respect the devotion and beliefs that practitioners of other faiths display. What struck me in seeing all your pictures is how much idolatry there is. It all looks nice, just seems over the top. 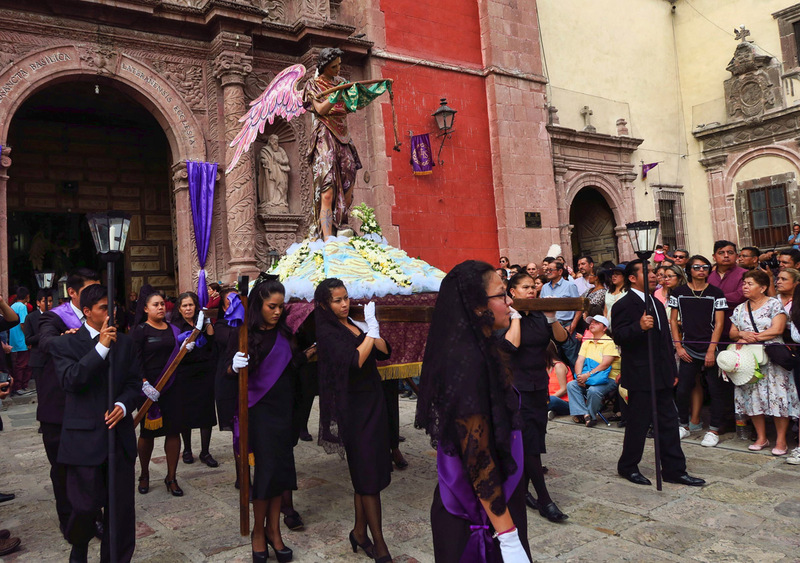 And the commercialization of religious holy days seems to be just as pervasive as we see in the US. You sentence – “Six cash prices for the best altar” is still stuck in my head. I guess praising God may take the form of a competition for some. I just can’t get my head around it. Loved the photos from your entry. I especially enjoyed Donald with his golden locks flying in the wind . 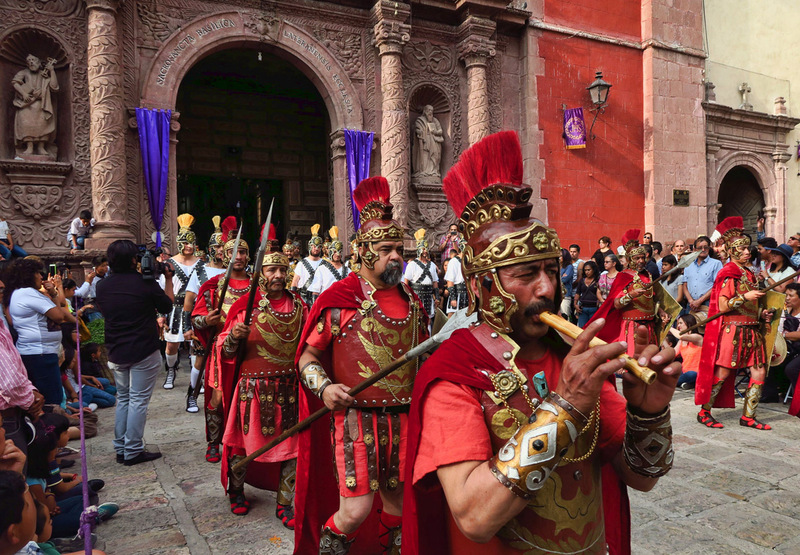 Loved all the pageantry you captured in your images Suzanne. 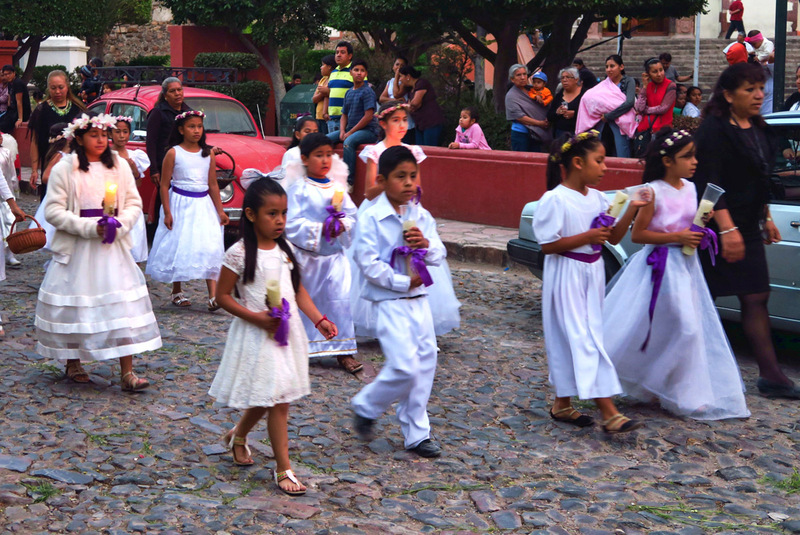 When we lived in Mexico, we followed most of the festivities in our little village of San Antonio Tlayacapan, where all the figures involved were of the human kind. Playing the role of Jesus was quite the honor. 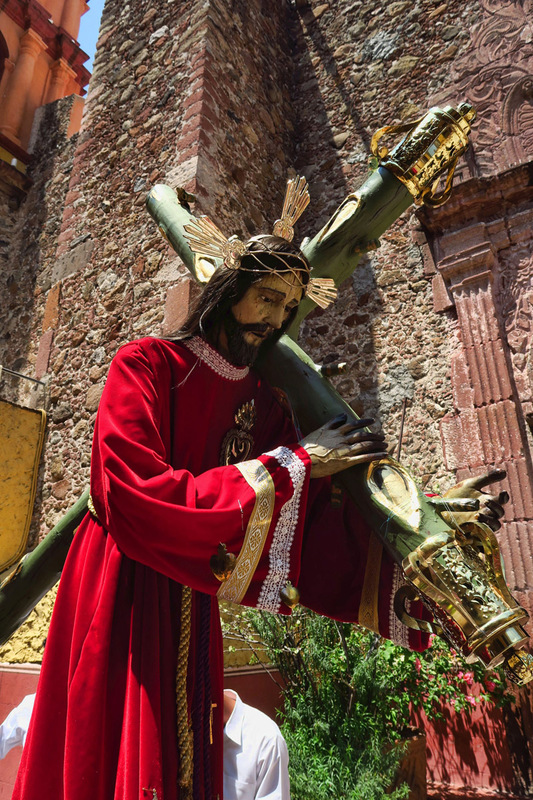 Seeing him carry a huge cross through the town was quite moving and in an open field the traitors and Christ were strapped to their crosses and raised for all to see. It was quite chilling.